The EmpInno project has issued two sets of recommendations, one for innovation intermediaries and one for authorities responsible for smart specialisation strategies. Based on the project experiences and exchange, the partnership provides hands-on guidance and derives lessons learnt for other strategy implementers and strategy owners for a better implementation of RIS3. Downloadable versions can be found here. Each project partner organisation produced an organisational coaching tool to increase its capacity to work with the RIS3. You can find these outputs which serve as examples for different kind of organisations, ranging from internal competence mapping to factsheets on smart specialisations here. In each partner region a RIS3 feedback paper is produced to provide feedback and recommendations from the project activities and experiences to the regional strategy owner to improve the RIS3. Feel free to approach the partners for learning about their findings and feedback. Cooperation among companies and innovation actors led to transnational synergy effects, for example through joint transnational delegation trips or the adaptation of successful good practices of R+D transfer workshops from one region to another. The partners joined forces in the six priorities ICT, Maritime Industries, Food, Energy, Advanced Materials and Health, Life Sciences and Biotech in which the partner regions have overlapping strengths. For each of these six priorities a Synergy and Empowerment Concept is produced to allow other innovation actors to adapt and implement good practices and lessons learned. The concepts can be found here. The highlights of successful good practices for R+D transfer, SME Empowerment and Matchmaking can be found at http://www.empinno.eu/good-practices . Learning also in the future from each other about RIS3 related topics is the core of the network of transnational RIS3 specialists (www.empinno.eu/network). The partners stay in contact and carry out joint activities. This happens on a strong basis of cooperation during the project – where the partners discussed about common issues of RIS3, exchanged good practices of regional innovation policy instruments and learned about the smart specialisation strategies from each other. Region Gävleborg shared their Good Practice of enhanced use of reference groups for stakeholder governance in innovation processes with the EmpInno partners.The region built the first Electric Road System (ERS) in the world on a public highway for heavy transport 2016 (E16 outside Sandviken). Building the ERS has required collaboration between many stakeholders from the public sector, the business sector and the academy in a triple helix context. One of the most important parts of the collaborative leadership has been the involvement of the reference groups in the innovation process. Reference groups have been a standard tool of project management for decades, but are seldom used to its full potential. The involvement of reference groups in the ERS innovation process has taken the tool to another level and is now a central part of the stakeholder governance. The reference groups are divided into certain areas of expertise for example risk analysis, road security, emergency rescue, business models. The core work group with the central stakeholders is called “the family”. Each of the participants has been handpicked which has been a prerequisite for successful use of reference groups. The motivation and driving forces behind every participant have been analysed to create win-win for everyone. A long term relation trust building approach is used by an open and transparent way of informing and discussing what is going on in the project. By being personally chosen to a workgroup where creative input and critical questions from everyone is valued the stakeholders feel included in the innovation process. The results have been critical contributions of knowledge, supporting attitudes to the innovation process and the stakeholder´s addition to the projects storytelling about the ERS as an important break-through for a more sustainable transportation system that creates a more profitable business for everyone. Nearly half of the carbon dioxide emissions in the region of Gävleborg come from transportation and most of all from heavy transportation connected to the industry. A full scale ERS deployment on proper roads creates a “green transportation system” and will have a substantial effect on the carbon dioxide emissions. The electricity in the region is nearly 100 % fossil free. Many of the actors in the reference groups therefore have a sense a pride for being a part of a world breakthrough innovation process with a potential for a structural transformation. Merry Christmas and a good start into the New Year! A full year of transnational exchange, local activities, developing outputs and preparing the final conference (6th/7th March 2019) lies behind us. Now it is time to rest, spend time with your beloved ones and let innovation policies and smart specialisation strategies make a pause. With full energy we are back in January 2019 to finalise the project and share with you the achievements. The EmpInno partnership wishes you a blessed Christmas time and a good start into 2019! On the 14-15 November 2018, the Marshal Office of the Kujawsko-Pomorskie Voivodeship organised a delegation trip for EmpInno partners and stakeholders to the Kujawsko Pomorskie Region, Poland. The agenda provided a combination of several visits to innovative companies in the region and of participating as experts in the Fifth European Congress of Agribusiness Managers in Łysomice. During the first day, the participants visited a series of companies active in the food industry sector and considered as innovative food producers and/or marketer of high-quality and healthy food products. Beside the possibility to learn about specific products or innovative production and marketing processes, EmpInno partners had the chance to exchange visions and ideas of how entrepreneurs can be part of regional innovation transfer and strategies. A practical example of how innovation transfer can be organised between academic institutions and entrepreneurs was given by the University of Science and Technology in Bydgoszcz (UTP). On the second day, EmpInno partners and stakeholders participated in the Fifth European Congress of Agribusiness Managers in Łysomice. The Congress is a two-day event for representatives of various enterprises in plant and animal production business, representatives of the agri-food processing sector and individual farmers. Beside being a stage for current trends in agriculture, production techniques and processes, the Congress also serves as a platform for innovation and knowledge transfer from the scientific community to the agricultural producers and entrepreneurs. Thereby, food security or environmental protection are among the topics that are transferred and discussed. EmpInno partners contributed by presenting good practices of innovative solutions for producers and farms based on the transnational exchange within the EmpInno partnership. Heading towards the final project phase, the 15 project partners came together at the 9th project meeting in Seinäjoki, Finland from 9-10 October 2018. The hosting partner Regional Council of South-Ostrobothnia showcased its strengths with a two-day programme that illustrated the outward orientation, entrepreneurial mindset and openness of its region. The partners shared their drafts e.g. of organisational coaching tools and feedback papers which help improve the regional smart specialisation strategies in the partner regions. Besides getting closer to the project outputs, the partners also discussed about how to communicate the EmpInno results. A major opportunity to do so is the final conference from 5-7th March 2019 in Potsdam/Berlin, for which a pool of ideas was brainstormed. The good practice of regional innovation policy instrument “Epanet University Network and University Consortium of Seinäjoki” was lively presented and certainly inspired several partners to consider joining scientific forces, based on a close triple helix cooperation between industry, university and governmental entities – also in less central cities and regions. Inspirational was also the general discussion about policy traps and different sources of power for implementing the RIS3 that was introduced by a keynote speech of Prof. Markku Sotarauta (Tampere University), entitled “Regional (Place) Leadership and Implementation”. Finally, the partners learned about the smart specialisation strategies from the two Finnish regions Satakunta and South-Ostrobothnia (available in the documents section) – including also their relations with other strategies like the regional programmes. This again underlined the different strategic contexts in which all RIS3 need to be considered when discussing e.g. about how to improve or monitor the RIS3. Finnish regions like the two presented are considerable smaller (e.g. less than 230.000 inhabitants) than e.g. the Baltic countries – nevertheless, they have their own smart specialisation strategy and other strategic programmes in place. How to support and fund the process from a discovery to a bio-business? On 28th/29th August 2018 the EmpInno partner Tartu Science Park organized together with the Tartu Biotechnology Park an R+D transfer workshop for biotechnology companies. The overarching topics were: "How to support and fund the process from a discovery to a bio-business" and "Precision Medicine’s impact on clinical diagnostics: Precision Diagnostics". In the Southern Estonian Smart Specialisation Strategy biotechnology is one of the smart specialisations of Tartu and South Estonia. The inspiring idea of the workshop was how to create a business from science ideas and bring the academic knowledge into practice. The presentation covered a range of aspects in clinical diagnostics/prognostics. Emphasis was put on oncology, including current global scientific trends, needs to be identified, developing and establishing key partnerships, market landscape, funding possibilities for SMEs, etc. In addition, and as part of funding and related to other aspects, presentations and discussions were held on the EIC|SME Instrument Program by providing examples and other relevant European Commission platforms as well as private funding possibilities for commercialisation of scientific knowledge. The lecturer was Iordanis Arzimanoglou, Senior Advisor to Genetic Diagnostic/Biomarker SMEs & Registered EASME|SME Instrument Business Innovation Coach. Many companies used the opportunity to have one-on-one consulting with the trainer (each 45 minutes). On the second day meetings were held in the Tartu Biotechnology Park incubator and the Estonian Genome Center, as well as company visited. The target groups of the workshop were the local life science (biotech) entrepreneurs and scientists in Estonia. The EmpInno partner Riga Planning Region has finalised and set-up its “interactive RIS3 analytical online platform”. It comprises and demonstrates data and other information that relate to the implementation of the Latvian smart specialization strategy. Moreover, the platform tool provides for better understanding of the existing ecosystems and allows for further analysis of the RIS3 processes in the region. This newly developed tool serves as assistance to regional and municipal staff members working in the RIS3 field, for instance, development planning and entrepreneurship officers. Its integration into the organisation’s daily routine enables regional and local RIS3 specialists to get better equipped with more practice-related knowledge about the RIS3 and its implementation possibilities on the local level. A proper understanding and use of data helps to identify certain growth areas or places that might require additional support. Five priority branches of the smart specialization strategy of Latvia have been mapped and analysed: 1) bio-economy, 2) bio-medicine, medicine technologies, bio-pharmaceuticals and bio-technologies, 3) information and communication technologies, 4) smart energy and 5) smart materials, technologies and engineering systems. In order to popularise the platform and ensure quick access, it will be placed on the internet page of Riga planning region. Other activities related to the dissemination of the organisational coaching tool include regional RIS3 seminars and discussions. Riga Planning Region is functionally a second-tier municipality whose task is to co-ordinate regional development processes in the fields of regional planning and support to entrepreneurship and by doing so it co-operates with 30 local municipalities and other external stakeholders. Five planning regions exist in Latvia, of which Riga Planning Region is by far the largest both in terms of population and economic activity. In EmpInno, each project partner develops a specific organisational coaching tool that enhances the internal capacity to apply the smart specialisation approach. Thus, 15 distinct approaches are followed and institutionalised in the partner organisations how to better work with the RIS3. Offshore wind study-visit delegates from the Satakunta region in Finland and from Rostock in Germany had a tight schedule as they were welcomed in Esbjerg by Offshoreenergy.dk end May 2018. The study visit was organized as part of the Interreg Baltic Sea Region programme funded project EmpInno aiming at enhancing the innovation capacity and business growth within small and medium sized regions and cities. Thus, topics of interest for the study visit included: How has Esbjerg developed into a hub for offshore wind in the North Sea? How is the innovation eco-system around Offshoreenergy.dk organised? And what kind of public support is offered to the offshore energy industry in Esbjerg? The study visit kicked off in the Town Hall where the Mayor of Esbjerg, Jesper Frost Rasmussen, welcomed the delegates and stressed the vital economic importance of the offshore industry in Esbjerg. All of which became even clearer as the delegates met with companies such as Vattenfall Renewables Wind, Atkins Company, Ocean Team Group and Blue Water Shipping and went on a guided tour around the port of Esbjerg. The Finnish delegation was composed by companies, the City of Pori and business development managers who are jointly working on establishing an offshore wind cluster in Pori that can act as a servicing hub for e.g. the Tahkoluoto Offshore Wind Farm – Finland’s first ever offshore wind park from 2010. Accordingly, attention was high when Vattenfall Renewables Wind presented to the delegates what demands and expectations the company holds towards suppliers to their wind parks and when Offshoreenergy.dk CEO Glenda Napier explained the structure and activities of the Danish offshore wind innovation ecosystem. Marko Lehtimäki from Pori Business Development also took part in the study visit and got some valuable impulses with him back home: “It is obvious that Denmark, and especially Esbjerg, has vast experience within offshore wind. There are good conditions for companies and some cooperation structures in place among the different actors in the value chain that makes the industry here both innovative and robust”. Marko continues with a reflection on where Pori is today in comparison: “Of course it takes time to establish a business environment as professional as in Esbjerg. We need to enhance our effort to bring all our offshore wind stakeholder – public as well as private – closer together to establish trust and cooperation. This visit to Esbjerg certainly has given valuable input to do so and among us delegates there is now an even stronger team-spirit to do it together”. The German delegation with the participation from Rostock Business, Wind Energy Network and a number of companies were especially interested in the transition Esbjerg has been through from being Denmark’s fisheries port number one, over tapping into offshore oil and gas industry in the early 1970s where the first oil was drilled from Dan-field in the North Sea to becoming an offshore energy metropolis from 2002 where the first large scale offshore wind park Horns Rev I was put in place in the North Sea. Ever since Esbjerg has been European leader in handling and shipping of offshore wind turbines. Andrea Reimer from EmpInno project lead partner Rostock Business and Technolog Development adknowledges: “The way Esbjerg and its many different actors have managed to create this offshore fairytail is exemplary. It takes dedication, skills and cooperation. We all certainly can learn a lot from that when it comes to business development”. Idea cube, customer journey map and industry map were some of the tools presented for 12 start-ups in Kaunas on June 13th when they took part in an interactive workshop on designing their way to business development. Through the six hours workshop, walls and tables were gradually covered by colorful post-its, stuck to large printed tools on paper sheets. For many of the start-ups, working with design methods was a new experience, creating new and valuable insights into their own business and which options were the most interesting to proceed with on the journey towards becoming a sustainable business. Thomas Holst Madsen, Senior Design Consultant from D2i – Design to innovate, facilitated the journey through the different design tools and approaches to business development. The workshop was organized as a co-working activity between two of the EmpInno partners, Kaunas Science and Technology Park, Lithuania, and D2i – Design to innovate, Denmark. D2i aims at implementing smart specialisation strategies on design in the Region of South Denmark by using design methods in creating growth in enterprises within all sectors. In Kaunas, methods used by D2i on local and regional companies in Denmark were tested for the first time on non-Danish ICT start-ups, giving D2i important knowledge and feedback on how their approach to implementing smart specialisation strategies works in different environments. For both the Lithuanian and Danish partner, the collaboration on developing and conducting the workshop forms part of internationalising their activities by providing enterprises the possibility of getting in contact and cooperate with organisations and enterprises across borders. If you want to know more about how design methods can be used to empower SMEs and start-ups to thrive and be more competitive please feel free to contact Kaunas Science Technology Park or D2i. On the 12-13 June 2018, the Kaunas Science and Technology Park (Kaunas STP) hosted the 8th meeting of the EmpInno project in Kaunas, Lithuania. All EmpInno partners from across the Baltic Sea Region took the chance to enhance their knowledge about implementation processes of RIS3 in their region and beyond. After some warm welcoming speeches from Tomas Černevičius from Kaunas STP, from the Leadpartner and a status-quo report of the overall project, the project partners exchanged their knowledge on how communication mechanism have been or should be implemented by strategy owners to get feedback from innovation intermediaries and further innovation actors regarding the implementation of RIS3. Three presentations of feedback mechanism from regional authorities in Satatunka Region (Finland), Östergötland Region (Sweden) and South Savo Region (Finland) enriched the knowledge exchange. Subsequently, an intensive working session on synergy and empowerment concepts to foster R&D transfer, economic cooperation and more outward mobility among innovation actors, SMEs, start-ups and researchers in the frame of RIS3 has been conducted. In this context, Kaunas STP from Lithuania and Prizztech Ltd. from Finland presented good practices from their own organisations. Kaunas STP presented “Breakfast for Innovators”, an regular event to connect relevant stakeholders in specific economic sectors and RIS3 areas and to foster R+D transfer by providing a platform of innovative knowledge transfer. Prizztech Ltd. presented the initiative Robocoast in the Region Satakunta in Finland that combines a range of regional initiatives with regard to industrial renewal, and which is acknowledged a digital innovation hub from the EU Commission. From Ieva Penelytė, Research and Higher Education Monitoring and Analysis Centre MOSTA and from Henrik Paape, advisor for the Department for Technology at the Ministry for Economics, Labor and Health in Mecklenburg-Vorpommern, the participants learned about the experiences in setting up and implementing RIS3 in Lithuania and Germany. Finally, the first day of the project meeting ended with a visit of the networking event “Kaunas Growing Business Awards (KAVA)” for the most successful Kaunas business product or service (see picture). On the second day the meeting started with a presentation of Heli Kurikka from the University of Tampere about the progress of renewing the RIS3 in the region of South-Ostrobothnia, Finland. A general discussion and working session followed under the motto “Strategy revolution or evolution: the future of RIS3 in your region?”. The EmpInno partners discussed the situation in their own region regarding the need or already initialised renewal process of RIS3. In general, the renewal process was seen as incremental by most regions and next steps of updating the respective RIS3s were discussed. The meeting came to an end with encouraging words by the project management team about the impact of the EmpInno project on initiated transnational partnerships and their support of the implementation of RIS3 in the EmpInno partner regions. In the afternoon, a study visit to historical sites in Kaunas City Center / Old Town concluded the meeting. In the first half of 2018, the EmpInno partner Regional Council of South Ostrobothnia together with XPort Finland – a business development company specialising on consulting services for export activities – launched a series of development clinics for SMEs all over the region. Main goal of this SME empowerment tool is to help SMEs developing innovation capacities and higher competitiveness beyond the regional market and improving their outward orientation. During several days in February, more than 30 representatives from local SMEs had the chance to discuss key topics of exporting strategies. Besides addressing specific resources, approaches and methods to expand to global market levels, the participants developed together with local experts tailored internationalisation strategies and started to take first steps of going global. During May and June 2018 the same companies met again for several follow-up sessions to exchange experiences and discuss their main challenges but also success factors of implementing their internationalisation strategies. The 17 UN Sustainable Development Goals reflect in many ways a circular economy and circular thinking. But how is it possible to combine these two domains? How can the Sustainable Development Goals be the direct starting point for the transition to a circular economy? In Kolding, Denmark, the EmpInno partner D2i – Design to innovate presented one way to get started. It happened at Wasteland, a series of local events focusing on circular economy and targeting public stakeholders. 30 representatives from local authorities and business support agencies participated in an interactive workshop, using design methods to turn an abstract topic into a subject with concrete action possibilities. Design thinking and design methods are relevant approaches when it concerns issues of big complexity, for instance how to create sustainable development and support the transition to circular economy. D2i – Design to innovate is one of several clusters in the Region of South Denmark implementing the regional smart specialisation strategy. By combining knowledge and competences on design and design methods, D2i provides public and private stakeholders with methods for innovation and strategy development, also when it concerns a complex area like circular economy. The aim of this particular workshop was to inspire public stakeholders to work with alternative methods in reaching some of the goals set at political level. The participants obtained a practical and hands-on knowledge of the value that design thinking can bring to complex issues like circular economy and sustainable development. They learned that abstract concepts and issues can be turned into concrete and approachable topics through design thinking. In that sense, the workshop provided them with a first basis of implementing the smart specialisation strategy or at least a better understanding of how it can be implemented in a way that makes sense. As an EmpInno activity, this workshop forms a concrete example of how strategy implementers like D2i – Design to innovate work together with strategy owners (policy makers) and other strategy implementers (business support agencies) on supporting the implementation of the regional smart specialisation strategy. On 13th April 2018, the Marshal Office of the Lubelskie Voivodeship organised a regional INNOVATION FORUM with the title “Healthy Food in Regional Quality of Life”. The meeting was conducted by the Lublin Centre for Research on Innovativeness as part of the EmpInno project and included 65 representatives of both companies and research units. Two working groups (food and health) formed within the Council for Innovation in the system for the RIS LV 2020. Their main task is to create recommendations and development plans for specific topics for the Board of the Region. Specifically, it is important to determine in which direction the development of healthy food and quality of life should go. Choosing the two topics of the Forum is not accidental, because innovations are born at the intersection of various specialisations and sectors. A one-way approach does not guarantee that specialisations will be developed. Dorota Skwarek, the Deputy Director of Department of Economy and Foreign Cooperation at the Marshal Office of the Lubelskie Voivodeship in Lublin, presented the tools to support the implementation of the above topics within international projects implemented by the Lublin Centre for Research on Innovativeness (including SmartWatch, Elise and EmpInno). She underlined the membership of the region in ERRIN and ERIAFF network (as an observer). The meeting is an inspiration for further actions, a starting topic for further meetings. Subsequent speakers characterised the EIT FOOD Community and AgroBioCluster. They also presented trends and dietary directions in the world, discussed the impact of proper diet on human health and its role in treating many ailments. Emphasis was placed on the importance of innovations in the food sector. Furthermore, the definitions of functional food and organic farming were discussed. In the second part of the meeting panelists discussed the possibilities of cooperation between science and business. They also pointed at the challenges and legal restrictions that producers must face. The growing demand of regional customers on organic food and consumers' eating habits were mentioned. The panel also discussed the biodiversity of the region based on knowledge, potential, practice and natural resources. At the end of the INNOVATION FORUM the participants had the opportunity to talk, exchange knowledge, experience and contacts during a networking lunch. EmpInno bears fruit - Kaunas Science and Technology Park adapts "Breakfast of Innovators"
On 20th March 2018, Kaunas Science and Technology Park (Kaunas STP) launched the event “Breakfast of Innovators” in Kaunas, Lithuania, to support the exchange and cooperation between innovation actors, SMEs, start-ups and researchers. The concept is based on a good practice from Finland, where the EmpInno partner Prizztech Ltd. successfully initiated the Techno lunch “MatchIndustry LAB” in 2016 as a regular event. The aim is to connect all relevant stakeholders in specific economic sectors and RIS3 areas and to foster R+D transfer by providing a platform of innovative knowledge transfer. The first “Breakfast of Innovators” in Kaunas was attended by 18 participants from 16 companies active in the Lithuanian energy sector, the Kaunas University of Technology and the Lithuanian Energy Institute. After an introduction by Kaunas STP, the largest Lithuanian energy company Lietuvos energija and its venture capital branch Contrarian Ventures presented technological solutions to current challenges of the energy sector and outlined relevant research fields. Furthermore, several SMEs and researchers took the chance for brief business presentations. As a first result of the platform, initiations of collaborations have been made between Lietuvos energija and two SMEs regarding the development of technological solutions. In order to institutionalise the “Breakfast of Innovators” as a new platform of R&D transfer in the region not only for Energy related stakeholders, Kaunas STP is planning to continue the event also for other priority areas of RIS3. The next event already takes place at the end of April 2018. Focusing now on ICT, start-ups, SMEs and researchers will get the chance to meet both national and international most attractive employers in the ICT sector including NFQ Technologies, Intermedix and DevBridge. On the 20-21 February 2018, the Tartu Science Park and the Tartu City Government organised the 7th meeting of the EmpInno project in Tartu, Estonia. All EmpInno partners from across the Baltic Sea Region were invited to the SPARK Demo Center to exchange their experiences on implementing the RIS3 in their region. After an introduction by the hosts and a status-quo report of the overall project, the project partners discussed of how RIS3 are communicated within different organizational settings. While Rostock Business and Lubelskie Voivodeship presented two different approaches to communicate Smart Specialisation Strategies within their own organisations, examples of how the RIS3 implementation is fed back to policy owners were given and discussed by four different partner regions. Two intensive working sessions on both meeting days covered the further development of relevant project outputs, namely the Synergy and Empowerment concept and the composition of recommendations for strategy owners and innovation intermediaries regarding successful strategies to implement and communicate respective RIS3 within their regions. Input of different roles and functions of RIS3 strategies as a regional innovation policy instrument was given by Jari Kohlemainen, University of Tampere, to inspire the discussion. To frame the thematic focus of EmpInno and to give new impulses to the participants regarding the implementation and maintenance of RIS3-related organisational structures, presentations of RIS3 implementation processes were given by the Business Advisory Services Estonia for Southern Estonia and by the Region Gävleborg for Gävleborg County. A guided tour through the SPARK Demo Center, a study visit to Estonian Genome Center at the University of Tartu and three presentations of relevant initiatives in Tartu regarding the support of business development - ADAPTER , Tartu Biotechnology Park, European Space Agency incubation centre - completed the program. On 28th February 2018 the South-Eastern Finland University of Applied Sciences (XAMK) Small Business Center of Mikkeli, Finland, and their associated partner Mikkeli Development Miksei Ltd invited local stakeholders to share experiences and progress on the implementation of RIS3 within the EmpInno project. Sinikka Mynttinen, RIS3 expert from the Small Business Center, presented the organization’s good practices for how to improve the RIS3 implementation. For internal communication, the Small Business Center appointed a RIS3 expert, edited regional RIS3-informations and communicated them internally and via the organizations website. To foster the implementation in the region, information events by regional authorities, network meetings by industry branches and diverse events customized to the business needs of SMEs were organized. To facilitate R+D transfer and to promote co-operation between research and business actors, Sinnika Mynttinnen pointed out to regular meetings, workshops and international conferences, presented good practices of the EmpInno project in Finland and other regions and highlighted several matchmaking events as possibilities to expand business networks in the Baltic Sea Region. Other good practices for the empowerment of SMEs from other partner regions were also exchanged such as Hackathon events or the MI Lab event in Finland, the Tartu Mobile Monday in Estonia or the SHOPA-workshop in Poland. Furthermore, other experts from different sections presented their perspective on the implementation process of RIS3. Tomi Heimonen from the South Savo Regional Council presented three regional specialisations: FOREST (New Products for Forest Biomass and production processes), WATER (Clean Water Technologies and Concepts) and FOOD (The food chain's cleanness and security). The research manager of sustainable wellbeing from South-Eastern Finland University of Applied Sciences shared her experience on the S3 Platform Agri-Food and highlighted the networking opportunities and Horizon2020 partnerships initiated by the S3 Platform. Likewise, Kari Aalto, Janne Uusivirta and Sointu Räisänen from East & North EU-office called attention to S3 thematic platforms as networking opportunities and presented the Horizon2020 program as a successful opportunity to foster co-operations between research and business actors. They stated that companies and organizations in South Savo have received about three million euros from Horizon2020 funds so far. On 15th November 2017 during the 10th Lublin Fair for Energetics ENERGETICS 2017 (Poland) an international conference "Energy independence at the local level" was held in Lublin. The conference was organised by the Foundation for Lubelskie Development – the coordinator of the Lublin Eco-Energy Cluster in cooperation with EmpInno partners. At the event 110 people participated, including entrepreneurs, representatives of regional government, universities, research and development units as well as students. The participants became familiar, among others, with the idea of creating and developing energy clusters; the role of renewable energy sources in achieving energy independence at the local level; developing cooperation between different environments for achieving energy independence of communities and poviats, as well as technologies and innovations in the field of energy production and distribution management at the local level. During the conference Sinnika Mynttinen from the South- Eastern Finland University of Applied Sciences, Small Business Center, presented Finnish experiences in developing cooperation between farmers and scientists to produce energy on local level. Dr Vytautas Šiožinys, UAB Energy Advice from Lithuania, presented the Renewable Energy Integration project, based on innovative IT solutions. Integral part of the conference were cooperative meetings (B2B) with the participation of Polish, Finnish and Lithuanian enterprises and institutions. The matchmaking events/meetings were organised by the Foundation for Lubelskie Development in cooperation with the Enterprise Europe Network Office managed by the Lublin University of Technology, Kaunas Science and Technology Park from Lithuania and the Regional Council of South Ostrobothnia from Finland. Twelve representatives of enterprises and institutions held fifteen B2B meetings during which they got to know each other and discussed possibilities of future cooperation. Moreover, on 14th of November 2017 in Lublin (Poland), an "Energy round table" was organised by the Foundation for Lubelskie Development as part of the EmpInno Project. The main objective of the round table was to discuss the tools and methods of implementing smart specialisation strategies (RIS3) in the partner regions of the EmpInno project, as well as to identify the main problems in cooperation between research units and entrepreneurs. Representatives of enterprises, research and development units, universities, regional government and business organisations from Poland, Finland and Denmark attended the meeting. During the round table the areas of smart specialization were assessed regarding the scale of impact on the regional economy, the methods and tools for implementing the RIS3 were discussed, as well as possible solutions which can improve their implementation and effectiveness. The cooperation between science and business was also evaluated and ideas and projects that could improve this cooperation were also identified. Conclusions from the meeting will be delivered to the Marshal's Office of the Lubelskie Voivodeship, responsible for the implementation of the RIS3. In November 2017 the Foundation for Lubelskie Development organised two workshops on the promotion of research and development cooperation between enterprises and universities in the regional smart specialisation renewable energy and improvement of energy efficiency. The workshops were attended by 29 representatives of enterprises, universities, research and development units, regional government and business organizations from the Lubelskie Voivodeship. During the two workshops, discussions on the development of R & D cooperation between entrepreneurs and universities were held. Two companies presented their experiences in cooperation with universities. Additionally, the University of Life Sciences in Lublin, the Lublin University of Technology and the Institute of Agrophysics of the Polish Academy of Sciences in Lublin presented their services, offers and possibilities of entrepreneurs´ participation in the HORIZON 2020 programme. During the workshop, the participants discussed the possibility of adapting Finnish good practices in Lubelskie Region: a practice regarding the organisation of events during which participants are working in interdisciplinary teams to develop new solutions for existing industry problems, as well as the idea and assumptions of the Mobile Monday & Incubators @Tartu project. The idea of the project is to initiate and intensify cooperation between entrepreneurs and universities in searching for innovative solutions. During the workshops also the method of creative solutions for innovative products – design thinking – was presented. This methodology will be used in the next stage of project implementation for finding innovative solutions to problems hindering the development of cooperation between entrepreneurs and universities identified during R & D workshops organised as part of the EmpInno project in Lublin. 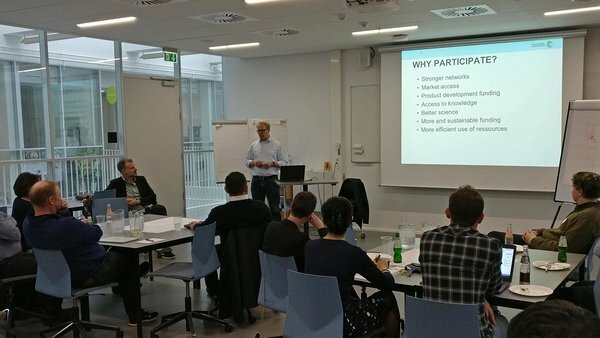 Late December 2017 South Denmark European Office (SDEO) and TEK Innovation at the University of Southern Denmark (SDU) organised two workshops to strengthen the cooperation between researchers and companies within the business areas clean-tech and robotics. The workshop concept as well as the learning from the interactive sessions between companies and researchers feeds into the EmpInno project as a good practice on how to “Engage and Motivate Small and Medium Sized Enterprises in Research and Innovation activities within the regional S3 framework”. Prior to the two workshops SDEO had collected innovation ideas and challenges from the interested companies. On that basis TEK Innovation identified and engaged relevant researchers at the University of Southern Denmark. This meant that during the actual workshops the exchange between companies and research was very focused and concrete. Claus Amtrup Andersen from EURISCO, a company working with software development for energy systems based in Odense, participated in one of the workshops that according to him was a positive experience. “The preceding work from the organizer to make relevant matchmaking between the participants was really good. The group I was in consisted of participant within the field of energy. That meant that it was easier and faster to find a case and to complement each other within the interest areas for both the academic world and the companies involved. The workshop was well prepared and relevant methods were used to facilitate and visualize the process” says Claus Amtrup Andersen. “The feedback from both researchers and companies has been very positive. Eight concrete innovation project ideas were the direct outcome of the workshops and an agreement to continue cooperation on project development on an even more focused one-on-one basis. On top both TEK Innovation and we at the South Denmark European Office will work to help find funding to realise the innovation projects”. To become more knowledgeable on the Region of South Denmark’s smart specialisation area Sustainable Energy, the South Denmark European Office (SDEO) facilitated the establishment of the Sustainable Energy Forum South Denmark. The forum had its kick-off in December 2017 at a meeting in the Region’s headquarters in Vejle with the participation of representatives from the Institute for Energy Technology of Aalborg University Esbjerg, the Center for Energy Informatics and NanoSYD of the University of Southern Denmark, the clean-tech cluster CLEAN as well as the Region of South Denmark and South Denmark European Office (SDEO). The forum is a result of SDEOs work in the EmpInno project and aims to bring together the competences and extensive knowledge in the Region of South Denmark, enhance cooperation and spur project development within the S3 area ‘Sustainable Energy’. The 6th EmpInno meeting on RIS3 empowerment for innovation and targeted growth took place in Lublin from 13-15th November. In the capital of the Lubelskie Voivodeship – the biggest city of Eastern Poland – the EmpInno partners from all across the Baltic Sea region came together to make joint progress on the transnational project. After the warm welcoming speeches given by the Polish partner hosts in the Lublin Development Foundation and the Lubelskie Voivodeship the project partners discussed how the involvement of SMEs took place in the Entrepreneurial Discovery Process of the smart specialisation strategies and whether SMEs are involved now. Given that the project has reached halftime, the partners started to work on a first part of recommendations related to the involvement of the end-users, since sharing one´s experiences is crucial to creating synergies and to producing added value that can benefit also actors beyond the partnership. From the two Polish Voivodeships Lubelskie and Kujawsko-Pomorskie the participants learned about the experiences in setting up and implementing their regional smart specialisation strategies. The Lubelskie Voivodeship presented the interrelations with the Central Baltic project SMART-Watch that serves to reduce the gap in monitoring systems for RIS3. Finally, the first day of the project partner’s meetup thus ended with an insightful study trip to URSUS – an internationally operating Polish company which specialises in the manufacture of agricultural machinery, based in Lublin. On the second day, the project partners were introduced to an internal workshop to work on the Business Modell Canvas. This instrument should inspire the project partners to further elaborate their organisational coaching tools to upgrade the capacity of working with the regional smart specialisation strategy. Finally, mutually enriching discussions took place in four of the project partners’ six smart specialisation areas (ICT, Energy, Food, as well as Health, Life Science and Biotechnology) for which regional stakeholders of the Lubelskie Voivodeship joined the project partners to establish contacts and networking. The meeting thus came to an end with many new ideas, diverse experiences and in-depth knowledge on the topic of RIS3. The next meeting will be held in Estonia in spring 2018 when the country is celebrating its 100th anniversary. What a great window of opportunity to continue cooperating and spreading the word on smart specialisation! How can we find innovative solutions to a complex problem? And how can companies produce the right product or service making them more competitive? When there are multiple solutions and directions a ‘one size fits all’-way of thinking doesn’t exist – in this case design-thinking and design-driven innovation (DDI) can be the answer. Design as a method can come across as elusive and perhaps difficult to understand but the benefits and possibilities there is in working design-driven easily outweighs the difficulties in learning a new method. Design and design-thinking offers a different approach, a range of methods, a mindset and a way to act and visualize issues, tasks, challenges and possible solutions. The method enables a company, organization or public entity to produce the right service, product or solution by following multiple paths, thus creating more growth and innovation. To give a clearer understanding of what characterizes DDI, let us look at some concrete examples. Design-driven innovation is characterized by three things; 1. by taking its outset in user needs, 2. in working holistically one will cover all areas of the issue and reach a better understanding of all perspectives of the issue and 3. putting things into a future oriented perspective will entail that the product, service or solution will remain sustainable. These characteristics ensures that DDI touches upon the whole innovation process and the whole value chain and accounts for all perspectives and potential problems. Therefore, when working design-driven, a multidisciplinary approach is key. When covering the entire process there is a need for different competences from various fields. When including the manufacturer, the company, the worker, the researcher, the programmer and so forth in the innovation process it will ensure a more comprehensive approach to the issue thus creating better solutions. When working design-driven you can expect to gain a new approach and new methods in the innovation process. When doing so it is also necessary to let go of some of the classic tools, such as result-based timelines and follow-ups that can kill the creative ideas and the innovation process. Southern Denmark has strong skills and actors in the field of design and the up-take of design and DDI by public authorities as well as companies and innovation actors has a positive impact. The multiple benefits of design-driven innovation lead the Region of Southern Denmark to support the design cluster organization Design to Innovate (D2i) (partner in EmpInno) to strengthen the use of design as a way of creating growth within the region’s companies. The Region of Southern Denmark considers design as a ‘growth motor’ and thus an important enabler for realizing the regions smart specialization strategy. Design is more than shapes, clothes and furniture - it is also a method. Design-thinking and DDI is exploiting multiple and different approaches and through that finding the right solutions to complex problems and not just ‘a solution’, as well as making companies more competitive because they manage to produce the right products and services. Future teaching (FUTE) is a EU-funded project where the Design School in Kolding as leading partner is working on incorporating design-thinking as a teaching-tool in Danish and European middle schools. The idea is that using design-thinking will create more inspiring teaching that will increase the students’ engagement in the teaching. Furthermore, the teachers that are educated in design as a method will experience a greater job satisfaction. Isover, an isolation company in Denmark, experienced a decline in demand because of the financial crisis but turned it around by going from ‘product sales to project sales’ with the help of D2i. This means that Isover now focus on the costumers needs working together with the costumers to find the right service and products for their need. The company in cooperation with D2i designed a service package, where they no longer just sell isolation products but instead are selling total projects including all material and related advice. By developing a new way of thinking and offering the right solutions for the costumers, the design process has made the company more competitive. The South Denmark European Office has facilitated a meeting within a network of the 22 municipalities in the region, with the purpose of creating a focus and share experiences in using design and DDI when creating public services or when engaging in European projects. When creating public services, it is obvious to take outset in the citizens needs and design offers methods to find the right solution and service. Therefore, SDEO wants to engage the municipalities in the region to think design into the innovation processes and into their projects. What are the smart specialisations of Kujawsko-Pomorskie Voivodeship? Where can I find funds for innovative projects? How to bring industry and science together? Answers on these questions as well as other practical information were available for participants of informational meetings held in Kujawsko-Pomorskie region. Since February 2017 Kujawsko-Pomorskie Innovation Agency meets local entrepreneurs and universities in different cities of the region spreading knowledge about smart specialisations and forthcoming calls for proposals. The purpose of the meetings is to disseminate information about smart specialisations as well as to present opportunities for financing projects based on smart specialisations. Within the workshop session participants discuss about possible network cooperation and preparation of new projects in the area of RIS3. Starting from February, four meetings with about 80 participants were accomplished. There were mainly regional entrepreneurs, business support institutions and delegates of scientific units interested in the subject of smart specialisations or whose activity is part of the region's smart specialisations. All meetings were divided into two parts. The first theoretical part included presentations of representatives of Kujawsko-Pomorskie Innovation Agency and external experts. The second part was dedicated to workshop and moderated discussion on the implementation of smart specialisations in the region. At the meetings participants focused on the following issues: competition and cooperation, building a network of entrepreneurial cooperation for the development of the chosen smart specialisation, developing of leading and niche sectors, evaluation of smart specialisations within the expected projects financed from regional operational programme, and RIS3 – opportunity or impediment and others. During the current meetings participants expressed many interesting views and postulates concerning the direction of smart specialisation development in the region. The following meetings are scheduled for the 3rd and 4th quarter of 2017. A first workshop on promoting research and development cooperation of enterprises with universities in the field of renewable energy and energy efficiency was organised at the headquarters of the Foundation for Lubelskie Development in Lublin on August 24th 2017. It was attended by representatives of enterprises, universities, scientific and research units and business organizations from Lubelskie Voivodeship. The meeting started a series of R+D transfer workshops implemented by the Foundation for Lubelskie Development in cooperation with the Marshal's Office of the Lubelskie Voivodeship at the Lubelskie Region. During the workshop the following topics were presented and discussed: the idea and rationale of the EmpInno project, technology transfer issues, research and development cooperation between enterprises and universities, opportunities for the development of the renewable energy industry in the light of the Regional Innovation Strategy for Lubelskie Voivodeship as well as possibilities of financing bio-economic projects. The participants also learned about good practices concerning R+D cooperation from other partner regions, among others the Östgöta-challenge was presented which was prepared by the Swedish Region Östergötland. During the meeting solutions and tools to improve the implementation of the Regional Innovation Strategy in the area of renewable energy smart specialization were discussed. Conclusions from the discussion will be forwarded to the Marshal's Office of the Lubelskie Voivodeship which manages the implementation of the Regional Innovation Strategy. Copyright @ Foundation for Lubelskie Development. The first three transnational delegation trips have been successfully conducted by the EmpInno partners. One aim of the project is to create opportunities for innovation actors to cooperate in RIS3-priorities (or sectors), in which the competencies of the partner regions overlap. Consequently, the Kiel Business Development Agency organised an exchange and matchmaking event of more than 20 ICT stakeholders alongside the CeBIT in Hannover, the first of its kind within the project. Despite the induced cooperation, the city of Tartu also presented its strengths and portfolio for ICT at the booth of Schleswig-Holstein and increased the visibility and potential linkages to other cities and regions. In May the City of Rostock hosted the second delegation trip held for the partners focusing on maritime industries. The sixth Future Conference Wind & Maritime saw especially the intensive exchange of Finnish partners and stakeholders with German counterparts on developments in the Onshore and Offshore Wind Energy Market, including global players – a cooperation initiated and intensified within EmpInno. Seinäjoki in Finland, namely the Farmari exhibition, was the destination for a delegation trip of stakeholders of the priority food. Project partners and key players from different Polish, Latvian and Finnish regions exchanged and had a matchmaking event. The participants also experienced a study visit that led to inspiring ways of commercialization and internationalization – challenges that several producers in this priority face in medium sized cities and regions. The delegation trips were supported by the Enterprise Europe Network in close collaboration with the partners as well as specific networks, a recipe that proves successful for the initiating of innovation cooperation. The next transnational delegation trips are under development, aiming to finally develop synergy and empowerment concepts for different target groups. How to create value by using “design as method”, how this spurs innovation and how the vibrant epicentre of the Danish design ecosystem in Kolding unfolds, was in the centre of the fifth project meeting in the last days of May. The cluster organisation D2i - Design to innovate hosted the transnational exchange during the international renowned Kolding Design Week (picture on the left from the Design School Kolding). Among others, the partners shared their experiences of the first transnational delegation trips that they initiated in the common specialisations ICT and maritime industries – events and activities which already lead to joint market and innovation opportunities for the participating companies and stakeholders. Moreover, the Region of Southern Denmark presented its smart specialisation strategy and showed the three specialisations agreed upon by the Southern Denmark Growth Forum in the business development strategy and action plan that focus on 1. Sustainable Energy, 2. Health and Social Innovation as well as 3. Experience Economy. For more information on the RIS3 of Southern Denmark in the download section click here. Finally, as visual dissemination support the participants glanced at some short videos that were produced by project partners to explain and illustrate the concept of RIS3. You can find them here. ICT meets Manufacturing event organised in Tartu - Tartu City Government organised a RIS3 information event "Manufacturing solutions today and tomorrow“ together with the Estonian ICT cluster and seven ICT companies in its regional RIS3 priorities of “ICT” and “enhancement of resources” on 18th of April in Tartu. More than 50 participants, majority of them being company managers, worked on the topics of “Internet of Things” and “Industry 4.0” and their future opportunities to create added value for Tartu and South-Estonian region and its RIS3 strategy. The participating SMEs, government and university representatives were informed about different solutions from human resource management to enterprise resource planning in order to better make use of ICT solutions and its applications to the firms located in Tartu and South-Estonia. On 11th of April Tartu City Government together with Tartu Science Park and Tartu Business Advisory Services organised an information seminar “Idea Tuesday” for local stakeholders in its regional RIS3 priorities in Tartu at the Spark Demo Centre. Anti Orav, a CEO with over 25 years of experience in running different companies, including one of the largest food production companies in Estonia, was invited to make a presentation about leadership and the role of the leader as a coach and mentor. More than 40 participants from SMEs, government and universities were inspired by the topics of “leadership” and “solution-based approach” and had the opportunity to communicate with each other to discuss regional innovation and their needs of support. The participants learned about various solutions from coaching tools to different matrixes and models on how to improve the usage of the available resources and strengthen the capabilities of the firms located in Tartu and South-Estonia to bring more added value for its RIS3 strategy. The partnership of the EmpInno project convened in the city of Norrköping, East Sweden, on 14th and 15th February for their fourth transnational meeting. Hosted by the Region of Östergötland, the partners further exchanged about how to raise organisational capacity to work with smart specialisation strategies and about general issues in the RIS3 process. To simplify the communication with internal and external stakeholders, the partners started the visual process of creating short videos, to spread the word about their region and their strengths. The partners from the Region Östergötland presented their regional innovation system and the RIS3 and discussed with the partnership about the approach to support regional enabling platforms instead of choosing priorities (you can find more information on the smart specialisation strategy in the download section here). Finally, the partners were impressed by a study trip to the research and science centre “Visualisation Centre C” that creates mind-blowing interactive digital experiences by combining state-of-the-art visualisation technology with intuitive interaction design. The initiative “Visual Sweden” is a part of the region's smart sepcialisation strategy that fosters innovation processes and was awarded by the highly competitive National Swedish innovation Programme “Vinnväxt” as winner a funding perspective for up to ten years. During the snowy days of 8th and 9th November 2016 the EU Strategy for the Baltic Sea Region (EUSBSR) held its Strategy Forum in Stockholm, Sweden. 1300 participants came together for two days to discuss about a “Vision 2030 for the Baltic Sea Region”. The EmpInno project used the opportunity to exchange with related initiatives, to network with the project´s target groups and discuss about smart specialisation issues across European regions. Contributing to the Policy Area Innovation of the EUSBSR, a slideshow introduced the approach and key facts of the EmpInno project in the “Creative Lounge” where most participants assembled during the breaks and networking slots. A documentation of the inspiring sessions and valuable thematic input can be found here. EmpInno Session at the Innovation Conference “Baltic Dynamics"
The EmpInno project organised the session “Empowering for innovation and growth in cities and regions” at the 21st International Conference on Innovation “Baltic Dynamics 2016 – Innovation and Technology Convergence Strategy for Smart Growth" on 15th September 2016 in Riga, Latvia. Among others, associated organisations and project partners from Denmark, Finland and Germany presented their local and regional activities related to the implementation of the RIS3, gave an overview of the project approach and discussed with the participants. The Baltic Dynamics conference was attended by about 150 participants representing the project´s target groups from more than 10 countries, including Mr. Markku Markkula, the President of the European Committee of the Regions. Riga in Latvia was the destination for the 16 project partners of the EmpInno project to meet for the third time on 13th-15th September 2016. It was discussed how project partners could better increase their organisational capacity to work with the RIS3 and make this available for the whole organisation, and how they institutionalize feedback to regional authorities in order to continuously improve the implementation of the smart specialization strategy. From the National Ministry of Education and Science, an overview was given of the RIS3 in Latvia and in particular how the implementation and monitoring system is in place (you can find more information on the smart specialisation strategy in the download section/here). Three initiatives as tools “how to get the RIS3 to business” illustrated their work and even exchanged business cards with project partners: the Demola Network Latvia and the incubators Creative Industries and Green Technology Incubator. Finally the hosting partner Riga Planning Region facilitated a study trip to the Design Factory at the Riga Technical University – an impressive instrument to valorise the potential of creative students and let them experiment and innovate at the same time. Kiel Business Development Agency organised the information event "Added value - Health - Innovation Management" together with the cluster management organisation Life Science Nord for local stakeholders in its regional priority “life sciences” on 6th September. Almost 40 participants, half of them were company representatives, worked on the topic of innovation management and future opportunities to create added value. The participating SMEs and researchers were informed about “What is the status – what is our aim?" and "Growth potential for the life sciences on the basis of the regional innovation strategy” by our project partner in order to better make use of the instruments provided by the RIS3 of Schleswig-Holstein. Colleagues from the Small Business Center of the Mikkeli University of Applied Sciences, located in the Finnish region of South-Savo, hosted the second project meeting from 13th-14th June 2016. Whereas the Nordic summer sun perfectly illuminated some of the regional priorities chosen in the smart specialisation strategy, e.g. the forest based bio economy and organic food production/food safety innovation, Tomi Heimonen from the associated organisation South Savo Regional Council did so in theory and practice during the meeting. He answered and discussed general issues concerning the RIS3 from the perspective of the “strategy owner” that has a long tradition of sharing the vision of strategies also with the public and local stakeholders (you can find more information on the smart specialisation strategy in the download section/here). Tomi also raised the question how in small regions, like South Savo, the innovation policy actors are able with small resources to encourage and establish an entrepreneurial culture to commercialize new innovations from laboratories and RIS process. The open discussion revealed experiences of the project partners, starting from new models of pop-up solutions to strategical entrepreneurship education policies of the partner regions. The partners further explored cooperation possibilities for their local companies in the six overlapping priorities of the partner regions and started to exchange on good practices of R+D transfer workshops as well as SME Empowerment tools. This May 26, 2016, the Kaunas Science and Technology Park organized an informational event titled “Future in IT: Business, Science and Venture Capital“ to promote its national RIS3 strategy and action plan in the priority area of transport, logistics and information and communication technologies (ICT). During this meeting, the business representatives discussed the challenges of implementation of Smart Specialization priorities for those companies that have been buidling their business on the cooperation with science providers. World class startups Uber and Inside Warehouse presented their success cases in relation to breakthroughs in the global economy and how business and science co-operation adds value to the competitiveness of their business operations. Furtermore, additional companies exhibited their advanced products and possibilities for further science and business co-operation, which were discussed during an informal dinner. The Interreg Baltic Sea Region Programme has approved the project “S3-Empowering for Innovation and Growth in Medium-Sized Cities and Regions” (EmpInno). From May 2016 until April 2019 sixteen project partner organisations cooperate to foster the implementation and improvement of regional smart specialisation strategies (RIS3). Kicking off their transnational cooperation, the first meeting in Rostock, Germany, from 15th-17th March 2016 brought together the partners to discuss the future project work and initiate local processes. The partner organisations, innovation intermediaries (“strategy implementers”) and regional authorities (“strategy owners”) from all Baltic Sea Region countries, are supported by a large number of associated organisations, including national ministries, further authorities responsible for the RIS3, cluster management organisations. © 2016 EmpInno Baltic Sea Region.